On March 15, 2019 a campaign to demonstrate against the lack of action to stop climate change will hold events around the world. Here in Japan, events are planned at Yoyogi Park, Tokyo (15:00) and at the City Hall in Kyoto (12:00-1300). 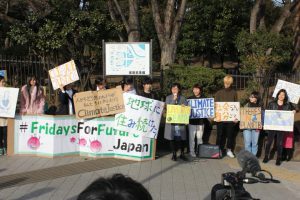 Again, on March 22 a demonstration will be held outside the Japanese Parliament Building in Tokyo (start 15:00). Bring your own plackard!